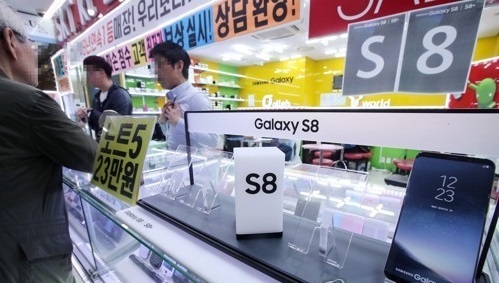 Samsung Electronics Co. started official sales of the Galaxy S8 and the Galaxy S8 Plus smartphones in South Korea, kicking off full-fledged efforts to strengthen its mobile business hurt by the discontinued Galaxy Note 7 phablets last year. The distribution of Galaxy S8 smartphones to preorder clients began earlier in the week ahead of the official release. Preorders for the Galaxy S8 and the Galaxy S8 Plus, which ran from April 7-17, surpassed the 1 million unit mark, setting a new record among all of the company's smartphones so far. Throughout Thursday, around 400,000 Galaxy S8 smartphones were estimated to have been registered by local mobile carriers. Accordingly, with so many phones already out, the market reacted relatively silent to the official launch of the flagship devices. "The loyal customers of the Galaxy series already bought the devices through preorders," an industry insider said. The devices feature high-resolution displays that bend at both edges and come with various innovative technologies, such as iris and face recognition scanners, and a smart voice assistant program named Bixby. Samsung has been focusing efforts to promote the device at home and abroad to put to rest the ill-fated Galaxy Note 7 controversy. Sales of the phablet were suspended last year after some caught fire while being recharged.